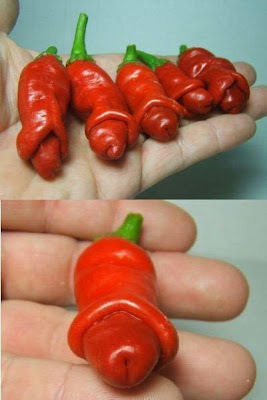 The world most 'naughty' looking Chilli???? These are actual peppers from a garden. They are called 'Peter Peppers'..
It’s native to Louisiana and Texas . Apparently it has always been grown more as an ornamental thing, rather than to be eaten, although it’s perfectly edible..
By the way, a farmer who specialises in growing them, says they can grow up to 18" long! Sort of brings a tear to your eyes, doesn't it? INFO : they are grown mostly around Ontario , Canada , the southern United States and in parts of Pakistan .